Sternberg Museum of Natural History, Fort Hays State University, Hays, Kansas, 67601. LEFT: Here a Late Cretaceous Mosasaurus hobetsuensis Suzuki (1985) cruises along the rocky shores of what would become modern day Japan. Copyright © 2002 by Dan Varner; used with permission of Dan Varner. This picture was painted for me as a gift for my host at the Morphogenesis conference I attended in Nagoya, Japan in 2002. Everhart, M. J., 2002. Rapid ontogenetic change in Late Cretaceous mosasaurs (Reptilia; Mosasauridae) as a model of vertebrate morphogenesis. International Conference on Morphogenesis and Pattern Formation in Biological Systems, Chubu University, Nagoya, Japan, p. 86. Following the extinction event(s) near the end of the Permian, the evolution and diversification of reptiles produced a great variety of extinct and modern forms including dinosaurs, birds, pterosaurs, lizards, turtles, snakes, and a diverse group that is generally referred to as marine reptiles. During the Triassic, some marine reptiles, including ichthyosaurs and plesiosaurs, evolved into a number of successful families that persisted through most of the Mesozoic. By the end of the Early Cretaceous, however, Ichthyosaurs had become extinct. During the Turonian, plesiosaurs were reduced to two families, the elasmosaurids and polycotylids, which apparently survived into the Maastrichtian. Mosasaurs were the last major group of reptiles to return to the sea, evolving from at least two (Russell, 1967), or possibly three or more (Bell and Polcyn, 2004) lineages of small, terrestrial lizards called aigialosaurs. They diversified rapidly, spread quickly and flourished in the Earths oceans during the last 25 million years of the Late Cretaceous. Their rapid rise and dominance occurred over a much shorter period of time than other marine reptiles and sharks, or terrestrial groups such as dinosaurs and mammals. 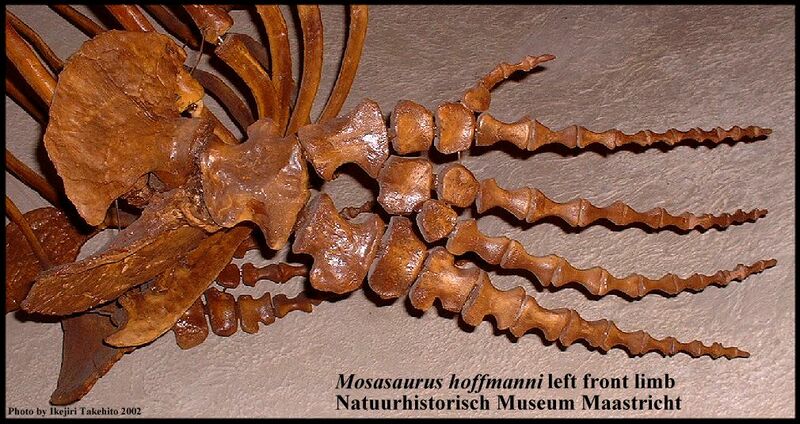 The remains of mosasaurs were initially collected in the Netherlands in the mid-1700s, some fifty years before the discovery of dinosaurs, and were among the first recognized fossils of large animals. Adrian Camper (1800) is credited as the first to recognize the relationship between the remains of Le Grand Animal of Maastricht (Mosasaurus hoffmanni) and varanid lizards (e. g., Komodo dragon). By 1850, mosasaur remains had been found in Cretaceous marine deposits around the world, including England, New Jersey, South Dakota and New Zealand. The 1868 discovery of the type specimen of Tylosaurus proriger in western Kansas brought two well known paleontologists of the day (O. C. Marsh and E. D. Cope) to the state, and resulted in the collection of literally thousands of specimens from the Smoky Hill Chalk over an interval of about ten years. 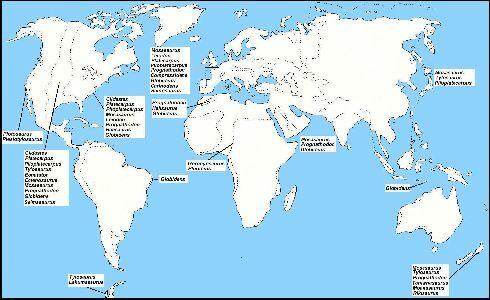 Since that time, mosasaur remains have been discovered on every continent, including Antarctica, and new species are being described and named at a steady pace (Table 1). Table 1  New species of mosasaurs described 1985-2008. Arranged by time of occurrence. New species of Halisaurus described from the upper Maastrichtian of Morocco, Africa, by Bardet, et al. (2005). New species of Prognathodon described from the upper Maastrichtian of the Netherlands, northern Europe, by Dortangs, et al., (2002). New species of mosasaurine described from the lower Maastrichtian of Hokkaido, Japan by Suzuki, 1985b. New mosasaurine described from the upper Campanian / lower Maastrichtian of Hokkaido, Japan by Sakurai and Shibuya, 1999. New species of Globidens from the upper Campanian of South Dakota, North America, reported by Martin 2007. New species of Prognathodon from the lower Campanian of Utah, North America, described by Kass (1999). New mosasaur from the upper Santonian of Vancouver Island, North America, described by Nicholls and Meckert, 2002. New tylosaurine from the upper Coniacian of Kansas, North America, described by Everhart (2005a). New mosasauroid genus and species from the Turonian of Columbia, South America, by Páramo-Fonseca (2000). New mosasauroid genus and species from the middle Turonian of Texas, North America, by Polcyn and Bell, (2005). New mosasauroid genus and species from the lower Turonian of Morocco, North Africa, by Bardet, et al. (2003). New mosasauroid genus and species from the lower Cenomanian of Israel by Polcyn, et al. (1999; 2003). By the end of the Cretaceous, two genera of mosasaurs (Mosasaurus and Hainosaurus) had grown to lengths of more than 15 m, and represented a group of marine carnivores that were as dominant in their environment as Tyrannosaurus rex was on land. Unlike T-rex, these giant mosasaurs were more widely distributed geographically and more numerous. During Maastrichtian time, mosasaurs were diversifying rapidly and entering many niches left vacant by the demise of other marine reptiles, and beginning to enter freshwater environments. From their fossil record, it is evident that mosasaurs were a highly successful group that became the apex predators of the Earths oceans rather suddenly during the Late Cretaceous. For all their success, however, they may have become too specialized and became extinct at or near the end of the Cretaceous, most likely due to a collapse of the marine ecosystem. The first mosasauroids appear in the fossil record during Cenomanian time in Europe and the Western Interior Sea. Small terrestrial lizards considered to be ancestral to mosasaurs (aigialosaurs and coniasaurs) have been found in the Adriatic region of southeastern Europe and in North America. Carroll and Debraga (1992) reported three mosasaur-like aigialosaur specimens from Cenomanian-Turonian (93 mya) deposits in Yugoslavia, and Bell and Polcyn (1996) documented the distribution of coniasaurs in the Western Interior Sea. Russell (1967) proposed two stem groups of aigialosaurids that were Clidastes-like (including Mosasaurus) and Platecarpus-like (including Tylosaurus). Martin and Stewart (1977), Bell (1995), and Bell and VonLoh (1998) documented mosasauroid and early mosasaur remains from Kansas, South Dakota and Texas. While it is likely that the first mosasaurs evolved from several different aigialosaurid lineages, the geographic origin(s) of the earliest mosasaurs is still uncertain. 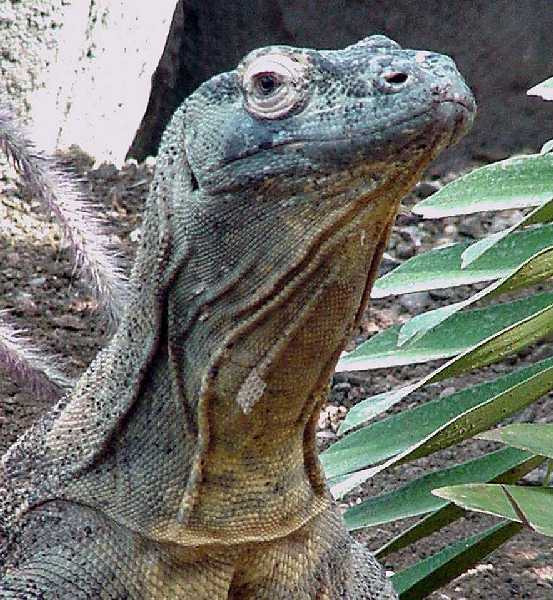 Their closest modern relatives are probably monitor lizards (varanids) like the Komodo dragon and quite possibly snakes (Caldwell, 1999), although the exact relationships are currently a matter of debate among mosasaur workers. Wherever they may have first entered the sea, it appears that they were able to spread rapidly around the world by migrating via shallower coastal waters. Similar species found as far apart as North America and New Zealand suggest that the initial spread of mosasaurs occurred rapidly, while other, highly derived species found in California and Africa provide evidence of the relatively rapid diversification of isolated populations. One of the issues related to the study of North American mosasaurs since 1868 has been the sheer number of specimens in collections, and the tendency of earlier workers to name new species from non-diagnostic material. Cope (1871) noted that a total of 6 species had been discovered in the cretaceous beds of Kansas. The following year, Cope (1872) reported 17 species from the Kansas chalk and a grand total of 42 species from Kansas, Alabama and New Jersey. Marsh (1880) noted that the Museum of Yale College contains remains of not less than 1,400 distinct individuals. Williston (1891) observed that there had been twice too many generic names given; so, too, it is pretty evident that there is an even greater number of synonyms among the specific names. Many of the early Kansas specimens had been collected by Professor B. F. Mudge, and by Williston (1898, p. 200) himself, who said I have seen altogether not far from 2000 specimens of Mosasaurs, and have collected with my own hands not less than 400. Williston (ibid., p. 169-170) also wrote that the determination of the species described by early authors [mostly E. D. Cope and O. C. Marsh] is in large part clearly impossible in the absence of the type specimens and four-fifths of all described species must be abandoned. Since Willistons time, the number of mosasaur genera and species has grown at a slower, more measured pace. In his study of the systematics and morphology of mosasaurs, Russell (1967, p. 121) indicated that a major problem was the proper application of 86 described species names of American mosasaurs to the hundreds of fragmentary to nearly complete skeletons in the collections of the American Museum and the Peabody Museum at Yale. Not only had Marsh and Cope named new species of mosasaurs from fragmentary material that would be considered non-diagnostic today, they had neglected to properly curate many of their type specimens. Russell (ibid.) reduced the number of genera and species of mosasaurs to more realistic levels. However, during the last two decades, and especially the last 10 years, discoveries of new material in various parts of the world have added greatly to our knowledge of mosasaurs, and to the number of valid species that are now recognized. 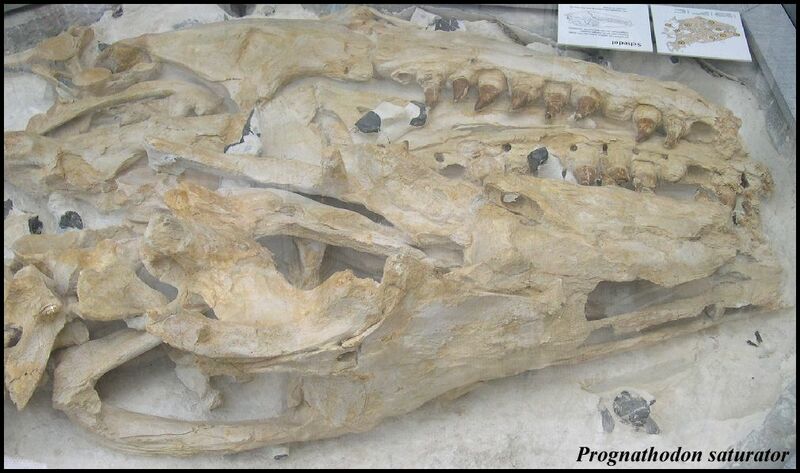 Although the pre-Coniacian remains of mosasaurs are rare, and usually fragmentary, two new, relatively complete specimens are currently being described from Texas by Bell and Polcyn (2005, in press) and Polcyn and Bell (2005, in press). It does appear that the divergence between the Clidastes-like and Platecarpus-like mosasaurs had occurred prior to the Turonian (Bell, 1995). Martin and Stewart (1977) described two sets of vertebrae and a jaw fragment from the middle Turonian Fairport Chalk Member of the Carlile Shale Formation in Kansas and noted their affinities with Clidastes. Another skull element (a Platecarpus-like frontal; KUVP 97200; Bell, pers. comm., 2004) from the same strata in Ellis County, Kansas is also in the University of Kansas collection. 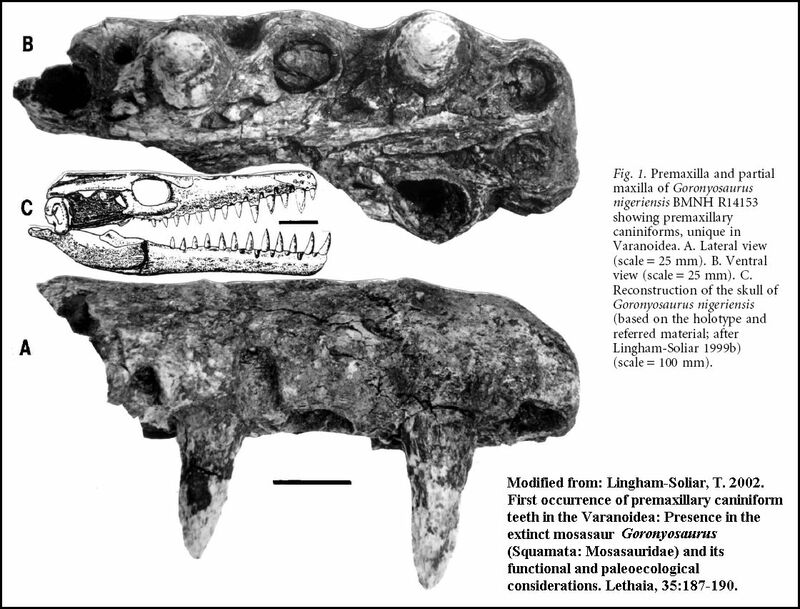 Lingham-Soliar (1994) reviewed mosasaur remains from the Upper Turonian of Angola in western Africa. Bell (1995) and Bell and VonLoh (1998) reported on fragmentary specimens of mosasauroids from the Boquillas Formation of western Texas and the Greenhorn Formation (Early Turonian) of South Dakota. A more detailed discussion of the stratigraphic occurrence of mosasaurs and their discovery worldwide is provided by Bell (1997). The first (and earliest) Tylosaurus remains from Kansas have recently been described from the Lower Campanian Fort Hays Limestone (Everhart, (2005b). Tylosaurus is certainly the earliest genus of large mosasaurs. The rise of mosasaurs can be visualized as occurring in three distinct waves (Table 2), each of which radiated outward from their point of origin. By middle Coniacian time (87 mya), the "first wave" of mosasaurs (Tylosaurus, Platecarpus, and Clidastes) was well established in the Western Interior Sea that covered Kansas and most of the Midwest portion of North America (Williston, 1898; Russell, 1967; Everhart 2001). As mosasaurs continued to evolve, growing larger and diversifying rapidly, a "second wave" of genera and species, including Hainosaurus, Plioplatecarpus, Mosasaurus, Globidens, and Prognathodon appeared near the beginning of the Campanian (83.5 mya). Following a possible near-extinction event near the middle of the Campanian reported by Lindgren (2004), mosasaurs rebounded, and a "third wave" was just getting underway during the final years of the Cretaceous, shortly before their final extinction. Table 2. Approximate age of occurrence of the various genera of mosasaurs in the Upper Cretaceous, Western Interior Sea of North America and elsewhere around the world. 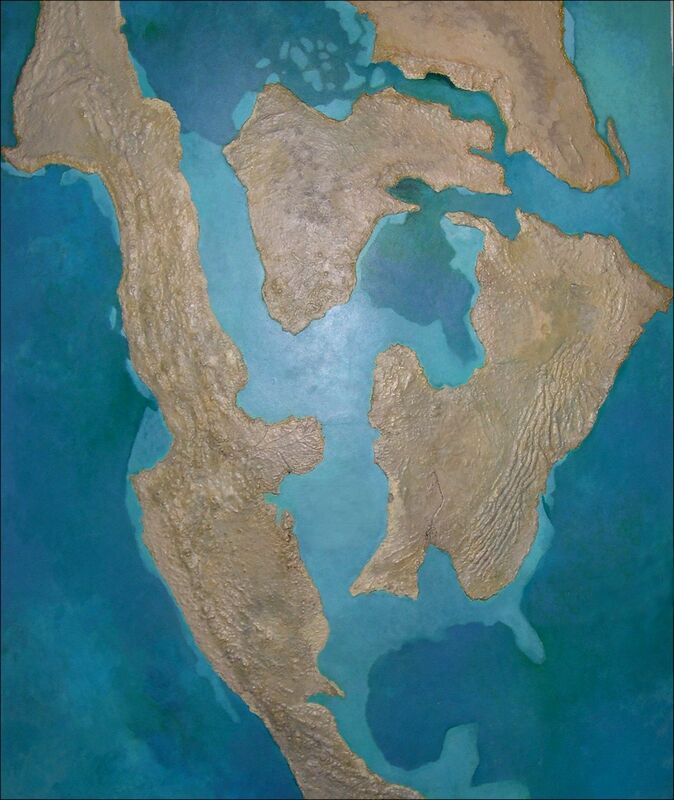 Maastrichtian 71.3-65.4 MYA 5.9 MY Greatest diversity and distribution; invasion of freshwater habitats. Beginning of "Third Wave" mosasaurs. Camp (1942) reported on two highly derived species of mosasaurs (Plotosaurus and Plesiotylosaurus) from the Maastrichtian age Moreno Formation of California that are quite unlike any other known species and indicative of an isolated population. Modifications to the skull, paddles and tail of Plotosaurus give it a decidedly ichthyosaurian appearance, and hint at a life style or habitat preferences that differ from most other mosasaurs (See Lindgren, Caldwell and Jagt (2008) for a more recent analysis). The crocodile-like Goronyosaurus nigeriensis (Lingham-Soliar, 1999a) and ichthyosaur-like Pluridens walkeri (Lingham-Soliar, 1998) from the Maastrichtian of Africa also represent highly divergent lineages. The durophagous mosasaurs (Globidens, Compressidens, Carinodens and to some extent, Prognathodon) represent a group that moved away from the normal mosasaur diet of fish and cephalopods (squid) and evolved stronger, more rigid skulls and specialized teeth adapted for feeding upon hard-shelled prey. Aigialosaurs, the ancestors of mosasaurs, were small terrestrial reptiles that reached lengths of about 1-2 m during Cenomanian time. By the early Coniacian, the largest genus of mosasaurs, Tylosaurus, grew to lengths of about 7 m, with Platecarpus and Clidastes being considerably smaller (Table 3). Following Copes Law, mosasaurs generally increased in size through the last 25 million years of the Cretaceous, with two species, Hainosaurus (a tylosaurine) and Mosasaurus reaching, reaching nearly 17 m (Lingham-Soliar, 1999b). As mosasaurs diversified, however, there were a number of smaller, durophagous species (e. g., Carinodens) that were occupying other ecological niches during Campanian and Maastrichtian time. More than anything else, the long, slender body shape and skeleton of a mosasaur resembled that of a snake. However, mosasaurs retained their front and rear limbs, and the chest region was noticeably expanded, a possible indication that, unlike snakes, they retained two lungs. The head was conical in shape and was extremely long and narrow in some species (e.g., Ectenosaurus clidastoides). While their body shape might be considered relatively inefficient for high-speed swimming compared with the models provided by ichthyosaurs and plesiosaurs, it appears likely that mosasaurs were more of an ambush predator than a pursuit predator (Massare, 1988). In that regard, the body shape, larger, more flexible skull, and swimming style evolved by mosasaurs appears to have been a more successful strategy for competing in the marine environment. Early mosasaurs were somewhat more conservative in the evolution of their body plan than the highly derived ichthyosaurs and plesiosaurs. Although they used the same side-to-side movement of their tail as the ichthyosaurs (compared to the wing-shaped paddles and underwater flight of plesiosaurs), they did not develop the lobed, semi-lunate tail. 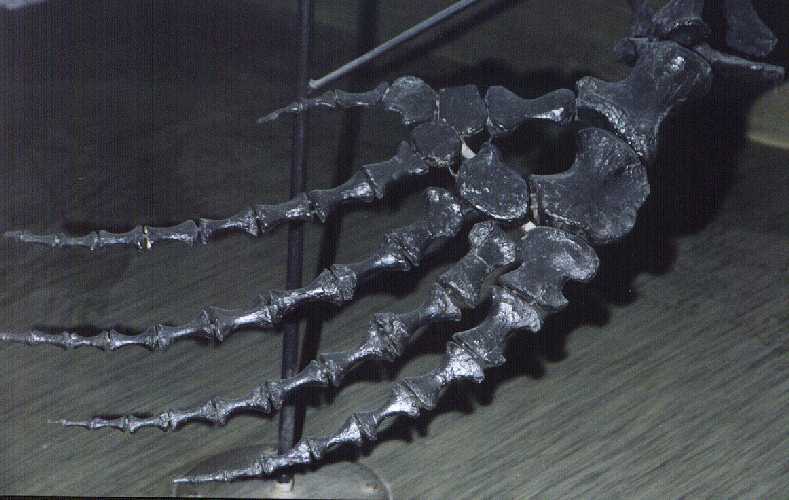 In overall appearance, they resembled a crocodile with paddles instead of legs and feet. It appears likely that most mosasaurs used their limbs for steering and attitude control, although the flexible, highly cartilaginous paddles of Tylosaurus may have had a slightly different functionality compared to the much more solid limb bones of Clidastes and Mosasaurus (Figure 1). In most early mosasaurs, the widely-spread digits were loosely joined by a webbing to form a flexible paddle, while in later genera (e. g., Plioplatecarpus and Plotosaurus) the digits were arranged tightly together to form a stiffer, wing-like structure. These highly derived paddles may have been more useful for propulsion in other than open-water environments (Lingham-Soliar, 1992: for a counter argument, see Nicholls and Godfrey, 1994). In either case, mosasaur limbs and limb girdles were rather quickly modified to the point that they would no longer support the weight of the animal out of the water. Based on the discovery of embryos in an aigialosaur (Caldwell and Lee, 2001) from the Cenomanian-Turonian of Slovenia, it is likely that live birth had evolved in the early mosasauroids at some before they returned completely to the sea. Freed from the necessity of laying their eggs on land, mosasaurs were probably completely marine animals by the early Turonian. Marine creatures face different problems than terrestrial forms in acquiring and swallowing prey because of the weightless, three-dimensional environment in which they live. Captured prey, if released, can float away, sink or be taken by competitors. As land dwelling reptiles that returned to the sea, mosasaurs had to adapt feeding strategies that addressed these issues. In the case of most of the ichthyosaurs and plesiosaurs, the solution was simply feeding on small fishes and cephalopods that could be captured and swallowed intact. While the body plans of the fish-like ichthyosaurs and highly streamlined plesiosaurs appear to be advantageous to capturing prey, both of these groups also had relatively small, rigid skulls that limited the maximum size of the prey that could be swallowed. Massare (1988) considered them to be pursuit predators, depending on their speed to chase down and acquire prey. As a result, their feeding strategy required a major expenditure of energy to catch large numbers of small fish and cephalopods. In the case of ichthyosaurs, and possibly plesiosaurs, their eventual extinction may have been related to the evolution of faster fishes and the competition from larger teleosts for the same prey. Mosasaurs, on the other hand, retained a relatively large skull that was 10-14% of their total body length (Russell, 1967; Everhart, 2001). 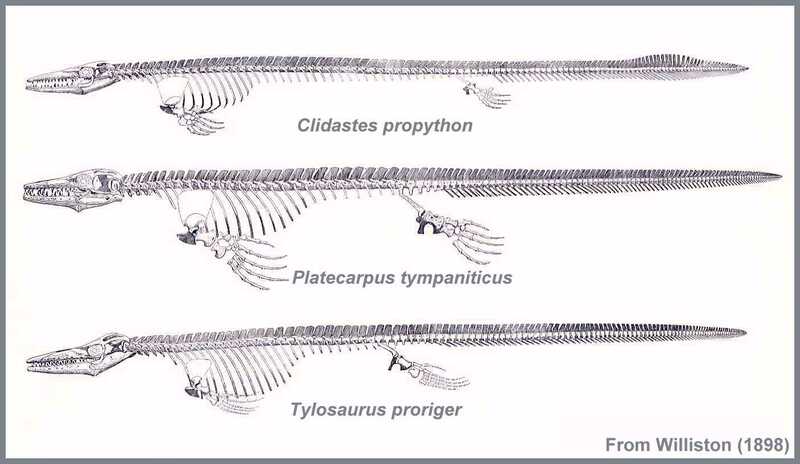 In addition, the skull in the earlier genera (Tylosaurus, Platecarpus and Clidastes) was highly kinetic (Russell, 1967), an adaptation seen in modern snakes that made the skull of these animals flexible enough to swallow much larger prey. Other feeding adaptations in mosasaurs included: a mobile quadrate that provided additional fore and aft movement to the lower jaw; an intermandibular hinge that allowed the lower jaws to bow outward as the prey was pulled into the mouth; pterygoid teeth that kept the prey from escaping as the lower jaw disengaged and moved forward; and a symphysial hinge between the tips of the lower jaws that allowed some degree of independent movement (Figure 2). The similarities between the jaw mechanics of mosasaurs and snakes are discussed in detail by Lee, et al. (1999). The teeth of the earliest mosasaurs were simple cones that were slightly recurved posteromedially. 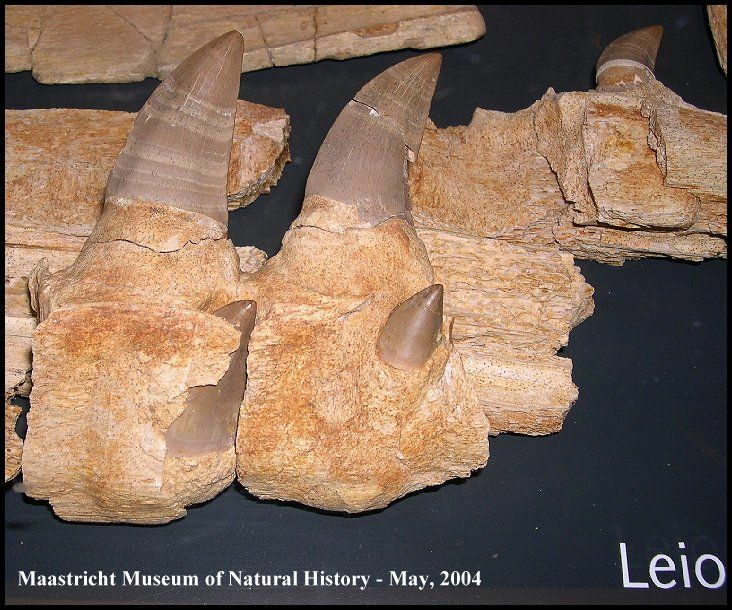 See Leidy (1858) for an early description of the teeth of Mosasaurus. Smaller species, such as Clidastes and Platecarpus, tended to retain slender, grabbing teeth for capturing small fish and cephalopods while the teeth of the larger Tylosaurus were much more robust and were probably used to seize and kill larger prey. Carina, if present, were small, and occasionally serrated. Mosasaur teeth are generally indicative of prey preferences, with Tylosaurus and Prognathodon being generalists that were capable of taking a variety of prey including large fish, birds, other mosasaurs (Martin and Bjork, 1987), and small plesiosaurs (Sternberg, 1922; Everhart, 2004). Only a few, poorly known species (e. g., Leiodon) appear to have developed narrow teeth with efficient cutting edges to cut flesh or dismember prey. At the other extreme, genera like Prognathodon evolved heavily built conical teeth that were capable of crushing hard shelled prey such as ammonites and turtles (Dollo, 1887; See bitten turtle shell fragment here). First described by Gilmore (1912), Globidens had a heavily built skull and rounded, ball-shaped teeth that were well adapted to feeding on clams and other shellfish. A relatively complete, but as yet undescribed Globidens specimen [NOTE: Globidens schurmanni was described by Martin (2007)] from the Pierre Shale of South Dakota was found with fragments of several species of bivalves in the abdominal area (Martin and Fox, 2004). The feeding mechanics of another, much smaller mosasaur with an unusual assortment of grasping and crushing teeth (Carinodens belgicus; Figure 3) were described by Schulp, et al. (2004). Other species, such as Plotosaurus (Camp, 1942) and Pluridens (Lingham-Soliar, 1998) appear to have evolved longer jaws that held a large number of smaller teeth for more efficient feeding on smaller prey, similar to the feeding mechanism of many ichthyosaurs. Figure 3. Restoration of Carinodens belgicus by Wouter Verhesen: A small (2 m) mosasaur from the Maastrichtian of the Netherlands with a highly derived dentition (Schulp, et al. 2004). Used with permission of the artist and the Natuurhistorisch Museum Maastricht. A highly derived African species (Goronyosaurus nigeriensis) developed functional canine teeth and a heavily built skull that resembles that of a crocodilian more than a mosasaur (Lingham-Soliar, 1999a). 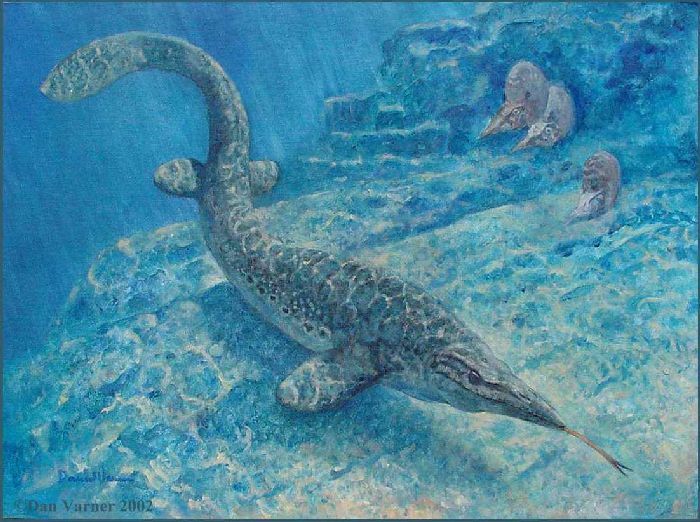 Remains of this Maastrichtian species, as well as those of a Plioplatecarpus from Canada (Holmes, et al., 1999) have been found in freshwater deposits, and may be evidence of competition between mosasaurs and terrestrial crocodilians. 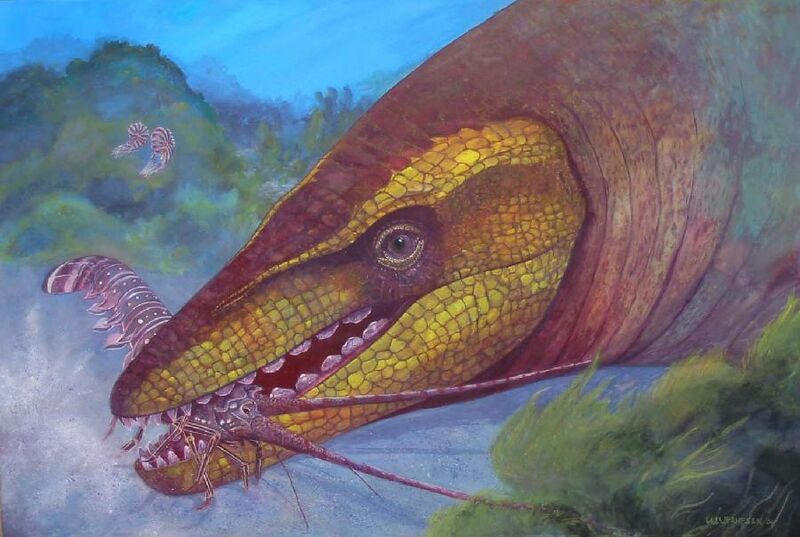 It has been known for more than a century that ichthyosaurs gave live birth to their young. 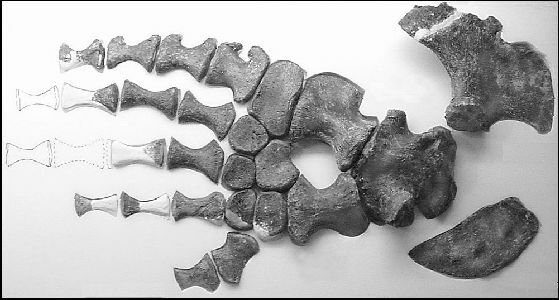 An as yet undescribed polycotylid plesiosaur specimen from the Pierre Shale of western Kansas shows indications of young within the body of an adult (Rothschild and Martin, 1993). Although Williston (1898) and Russell (1967) argued against live birth in mosasaurs, they did not cite evidence of nesting sites or protected areas where smaller mosasaurs had been found. More recently, Bell, et. al. (1996) and Bell and Sheldon (2004) reported the discovery of a mother mosasaur with skeletal elements of at least four babies in her abdomen. 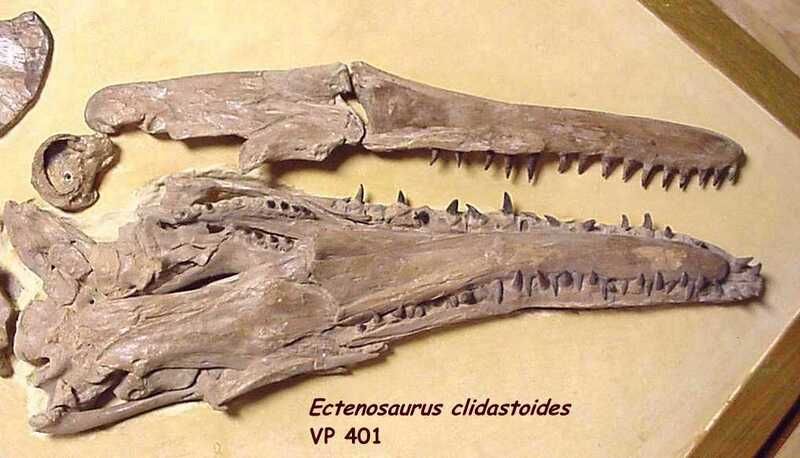 Caldwell and Lee (2001) described a mosasaurid specimen from southeastern Europe that contained embryonic material. Sheldon (1990) and (Everhart, 2002) noted the presence of many specimens of small mosasaurs from the Smoky Hill Chalk, an indication of mosasaurs were giving birth in mid-ocean. It is likely that the reproductive strategy of mosasaurs involved the investment of the mothers resources in a relatively small number of larger, well-developed babies instead of laying a large number of eggs like marine turtles or crocodiles. 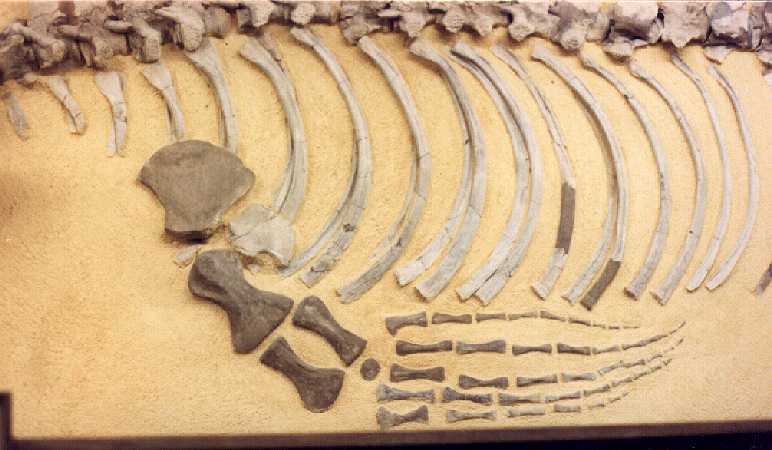 From the remains that have been found, it appears that baby mosasaurs were between 1 and 2 m in length at birth (Everhart, 2002; Bell and Sheldon, 2004). In the case of the Niobrara Chalk (Coniacian through lower Campanian) of western Kansas, the remains of very young mosasaurs were found in an area that would have been more than 300 km from the nearest coast on the eastern edge of the Western Interior Sea. While it has been speculated that there may have something similar to a kelp forest or seaweed mat to provide shelter for small animals but no evidence for such a scenario has been found. Even with larger sizes at birth, the survival rate of young mosasaurs was probably low in an environment shared with large sharks, giant teleosts and other mosasaurs. However, the fossil record indicates that enough individuals reached reproductive age to maintain population growth over a long span of time. As noted earlier, mosasaurs spread rapidly around the world during the later stages of the Cretaceous, quickly becoming the apex predator of the Earths oceans and occupying various other niches left vacant by the extinction of the ichthyosaurs, the reduction in numbers of plesiosaurs, and possibly even the extinction of large, pelagic shark species like Cretoxyrhina mantelli. While Williston (1898) and Russell (1967) reduced the inflated number of species reported by Cope and Marsh, the number of recognized mosasaur species continues to grow as new specimens are found and new localities are explored (Table 1). Lingham-Soliar (1999b) estimated that there were about 20 genera and 45 species of mosasaurs living at the end of the Cretaceous. Based on recent discoveries, it is likely that those numbers may be underestimated by a factor of 2 or more. Mosasaurs appear to have spread from the Western Interior Sea north and west along the rim of the western Pacific, with similar genera showing up in Japan and across the equator in Australia and New Zealand (Figure 4). Movement probably occurred in both directions across a much narrower northern Atlantic between the east coast of North America and Europe. Similar migrations appear to have occurred through the Tethys Ocean over submerged portions of Europe and Africa, and into the Middle East. A new species of tylosaurine mosasaur (Lakumasaurus antarcticus) discovered in upper Campanian  lower Maastrichtian deposits on an island off the coast of Antarctica (Novas, et al., 2002) provides additional data on the worldwide distribution of this genus. The presence of Mosasaurus hobetsuensis in Japan (Suzuki, 1985b) and a recent discovery of a mosasaur much like Mosasaurus hoffmanni in Turkey (Bardet and Tunoglu, 2002) indicates that, like tylosaurines, this genus was also living in many places around the world. Figure 4. A generalized map of the Earth showing the approximate locations of known mosasaur genera during Campanian-Maastrichtian time. The dashed lines indicate the probable extent of epicontinental seas at the same time. (Adapted from Suzuki, 1985a). Click here for a more detailed map of the Western Interior Sea of North America. It is likely that the success of mosasaurs as predators led to a population explosion and created pressure to expand into new territories. In the case of two of the largest and most ubiquitous genera, Tylosaurus and Mosasaurus, the distances traveled would have been roughly half way around the world (roughly 20,000 km). While this is a relatively large distance, an expanding population could easily move that far in 4000 years at an average rate of 5 km per year. For an animal that was well adapted to living completely at sea, it is more likely that mosasaurs spread around the world at a much faster rate. Although the origin, timing and direction of these migrations is still uncertain, relict populations of highly derived mosasaurs such as those found in the Maastrichtian of California and Africa may eventually shed some light on these issues. New discoveries continue to add both to the number of species that are known and the extent to which the various genera dispersed across the oceans of the Late Cretaceous. During the last 25 million years of the Cretaceous, mosasaurs evolved relatively quickly from small shore-dwelling lizards into the dominant marine predators in the oceans of the Earth. Their adaptations to life in the ocean included a highly kinetic skull and jaws, major modifications to the axial skeleton and limbs, changes in body shape and covering, growth to very large size, and live birth. The evolution of mosasaurs can be considered as a pre-Tertiary model of rapid adaptive radiation. I thank Gorden Bell, Mike Polcyn and Dale Russell for our continuing discussions of all things mosasaur, J.D. Stewart and Donald Hattin for their insights into the stratigraphy and the appearance of mosasaurs in the Niobrara Chalk of western Kansas. I am also grateful to Richard Zakrzewski (Sternberg Museum of Natural History), Larry Martin and Desui Miao (University of Kansas Museum of Natural History), James Martin and Carrie Herbel (Museum of Geology, South Dakota School of Mines and Technology), Earle Spamer and Ted Daeschler (Academy of Natural Sciences of Philadelphia), Robert Purdy and Michael Brett-Surman (United States National Museum), Anne Schulp (Natuurhistorisch Museum Maastricht) and Kazuhiko Sakurai (Hobetsu Museum, Hobetsu, Hokkaido, Japan) for access to specimens in their care. Yoshiyuki Usami (Kanagawa University, Yokohama, Japan) facilitated my trip to the conference in Nagoya, Japan in 2002. Bardet N., X. P. Suberbiola, and N-E Jalil. 2003. A new mosasauroid (Squamata) from the Late Cretaceous (Turonian) of Morocco. Comptes Rendus Palevol 2(8): 607-616. Bardet N., X. P. Suberbiola, M. Iarochene, F. Bouyahyaoui, B. Bouya, and M. Amaghzaz. 2005. A new species of Halisaurus from the Late Cretaceous phosphates of Morocco, and the phylogenetical relationships of the Halisaurinae (Squamata: Mosasauridae). Zoological Journal of the Linnean Society 143: 447-472. Bardet, N. and C. Tunoglu. 2002. The first mosasaur (Squamata) from the Late Cretaceous of Turkey. Journal of Vertebrate Paleontology 22(3): 712-715. Bell, G. L., Jr. 1995. Middle Turonian (Cretaceous) mosasauroids from Big Bend National Park, Texas. In Santucci, V. L. and L. McClelland, (Eds. ), National Park Service Paleontological Research, U. S. Department of the Interior Technical Report NPS/NRPO/NRTR-95/16, p. 34-39. Bell, G. L. Jr. 1997. Part IV: Mosasauridae - Introduction. pp. 281-292 In Callaway J. M. and E. L. Nicholls, (eds. ), Ancient Marine Reptiles, Academic Press, San Diego. Bell, G. L. Jr. and M. J. Polcyn. 1996. Distribution of the lizard, Coniasaurus, in the western interior Cretaceous seaway and its paleoecological implications. Geological Society of America, Rocky Mountain Section Annual Meeting, Abstracts with Programs, 28(4): 2. Bell, G. L. Jr. and M. J. Polcyn. 2004. Polyphyly of Mosasauridae: The growing body of evidence. In Schulp, A. S. and John W. M. Jagt (eds. ), Abstract book and field guide of the First Mosasaur Meeting, Natuurhistorisch Museum Maastricht, the Netherlands, p. 15. Bell, G. L. Jr. and M. J. Polcyn. 2005. Dallasaurus turneri, gen. et. sp. nov. (Squamata; Mosasaurinae); A new primitive mosasauroid from the Turonian of Texas and comment on the polyphyly of Mosasauridae. Netherlands Journal of Geosciences / Geologie en Mijnbouw. Bell, G. L. Jr., M. A. Sheldon, J. P. Lamb and J. E. Martin. 1996. The first direct evidence of live birth in Mosasauridae (Squamata): Exceptional preservation in Cretaceous Pierre Shale of South Dakota. Journal of Vertebrate Paleontology 16(Supplement to 3): 21A. Bell, G. L. Jr., and A. M. Sheldon. 2004. A gravid mosasaur (Plioplatecarpus) from South Dakota. In Schulp, A. S. and John W. M. Jagt (eds. ), Abstract book and field guide of the First Mosasaur Meeting, Natuurhistorisch Museum Maastricht, the Netherlands, p. 16. Bell, G. L. Jr., and J. P. VonLoh. 1998. 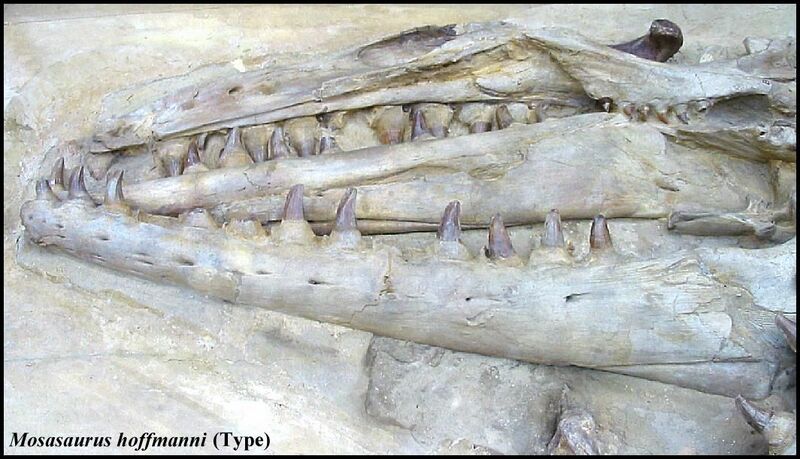 New records of Turonian mosasauroids from the western United States. Fossil vertebrates of the Niobrara Formation in South Dakota, Dakoterra 5: 15-28. Bernard, A., Lécuyer, C., Vincent, P., Amiot, R., Bardet, N., Buffetaut, E., Cuny, G., Fourel, F., Martineau, F., Mazin, J-M. and Prieur, A. 2010. Regulation of body temperature by some Mesozoic marine reptiles. Science 328:1379-1382. Caldwell, M. W. 1999. Squamate phylogeny and the relationships of snakes and mosasaurids, Zoological Journal of the Linnean Society 125: 115-147, 7 figs. Caldwell, M. W. and M. S. Y. Lee. 2001. Live birth in Cretaceous marine lizards (mosasauroids). Proceedings: Biological Sciences 268(1484): 2397-2401. Camp, C. L. 1942. California Mosasaurs. University of California Press, 67 pages. Camper, A. G. 1800. Sur les ossemens fossiles de la montagne de St. Pierre, à Maëstricht (Lettre de A. G. Camper à G. Cuvier). Journal de Physique 51: 278-291, pls. 1-2. Carroll, R. L. and M. Debraga. 1992. Aigialosaurs: Mid-Cretaceous varanid lizards. Journal of Vertebrate Paleontology 12(1): 66-86. Cope, E. D. 1871. On the fossil reptiles and fishes of the Cretaceous rocks of Kansas. Preliminary Report of the United States Geological Survey of Wyoming and Portions of the Contiguous Territories (Hayden), Part IV, Special Reports, 6: 385-424. Cope, E. D. 1872. On the geology and paleontology of the Cretaceous strata of Kansas. Preliminary Report of the United States Geological Survey of Montana and Portions of the Adjacent Territories, Part III - Paleontology, pp. 318-349. Dollo, L. 1887. Le Hainosaure et les nouveaux vertébrés fossiles du Musée de Bruxelles. Revue des Questions Scientifiques 21: 504-539; 22: 70-112. Dortangs, R. W., A. S. Schulp, E. W. A. Mulder, J. W. M. Jagt, H. H. G. Peeters and D. Th. de Graaf. 2002. A large new mosasaur from the Upper Cretaceous of the Netherlands. Netherlands Journal of Geosciences / Geologie en Mijnbouw 81(1): 1-8. Everhart, M. J. 2001. Revisions to the biostratigraphy of the Mosasauridae (Squamata) in the Smoky Hill Chalk Member of the Niobrara Chalk (Late Cretaceous) of Kansas. Kansas Academy of Science, Transactions 104(1-2): 56-75. Everhart, M. J. 2002. Remains of immature mosasaurs (Squamata; Mosasauridae) from the Niobrara Chalk (Late Cretaceous) argue against nearshore nurseries. Journal of Vertebrate Paleontology 22(Supplement to 3): 52A. Everhart, M. J. 2004. Plesiosaurs as the food of mosasaurs; new data on the stomach contents of a Tylosaurus proriger (Squamata; Mosasauridae) from the Niobrara Formation of western Kansas. The Mosasaur 7: 41-46. Everhart, M. J. 2005a. Tylosaurus kansasensis, a new species of tylosaurine (Squamata, Mosasauridae) from the Niobrara Chalk of western Kansas, USA. Netherlands Journal of Geosciences / Geologie en Mijnbouw 84(3), p. 231-240. Everhart, M. J. 2005b. 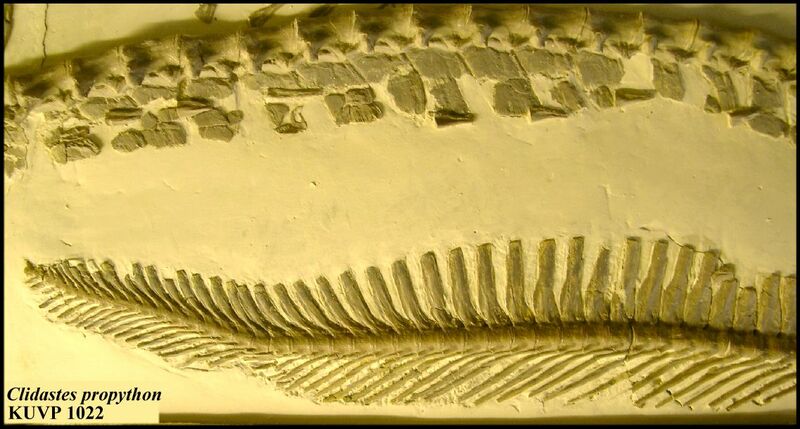 Earliest record of the genus Tylosaurus (Squamata; Mosasauridae) from the Fort Hays Limestone (Lower Coniacian) of western Kansas. Transactions 108 (3/4): 149-155. Geist, N. R., Carpenter, S., and Stewart, J. D. 2002. Chemical and morphological analysis of soft tissue preservation in a mosasaur. Journal of Vertebrate Paleontology 22(Supplement to 3): 57A. Gilmore, C. W. 1912, A new mosasauroid reptile from the Cretaceous of Alabama. Proceedings U.S. National Museum 40(1870): 489-484. Holmes, R., M. W. Caldwell, and S. L. Cumbaa. 1999. A new specimen of Plioplatecarpus (Mosasauridae) from the lower Maastrichtian of Alberta: Comments on allometry, functional morphology, and paleoecology. Canadian Journal of Earth Science 36: 363-369. Jacobs, L. L., M. J. Polcyn, K. Ferguson, C. Rennison and L. H. Taylor. 2004. Age, environment, and habitat of dolichosaurs and primitive mosasauroids. In Schulp, A. S. and John W. M. Jagt (eds. 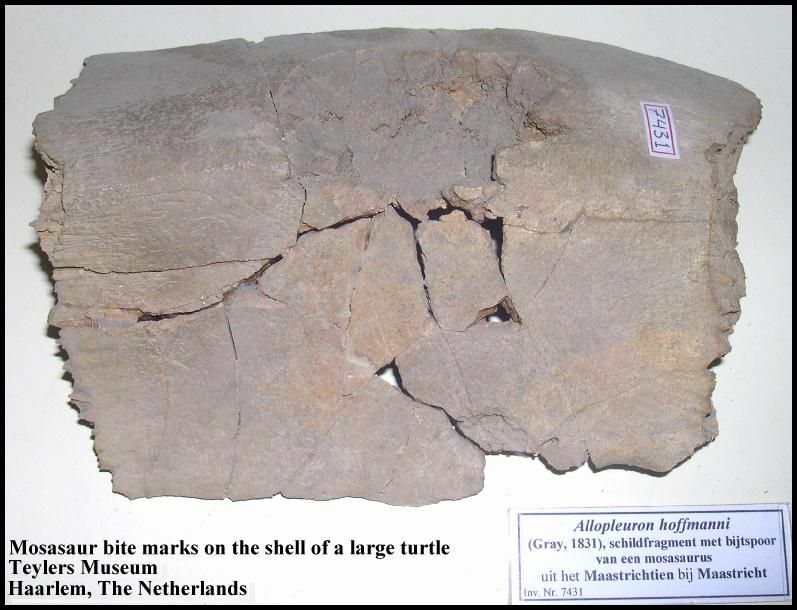 ), Abstract book and field guide of the First Mosasaur Meeting, Natuurhistorisch Museum Maastricht, the Netherlands, p. 51. Kass, M. S. 1999. Prognathodon stadtmani (Mosasauridae): A new species from the Mancos Shale (Lower Campanian) of western Colorado. In Gillette, D. D. (ed. ), Vertebrate Paleontology in Utah, Utah Geological Survey, Miscellaneous Publication 99-1: 275-294. Konishi, T. and Caldwell, M. W. 2007. New specimens of Platecarpus planifrons (Cope, 1874) (Squamata: Mosasauridae) and a revised taxonomy of the genus: Journal of Vertebrate Paleontology 27(1): 59-72. Lee, M. S., G. L. Bell, Jr. and M. W. Caldwell. 1999. The origin of snake feeding. Nature 400: 655-659. Lindgren, J. 2004. An intercontinental mosasaur extinction event at the early/late Campanian boundary. In Schulp, A. S. and John W. M. Jagt (eds. ), Abstract book and field guide of the First Mosasaur Meeting, Natuurhistorisch Museum Maastricht, the Netherlands, p. 57-58. Lindgren, J., Caldwell, M.W. and Jagt, J.W.M. 2008. New data on the postcranial anatomy of the California mosasaur Plotosaurus bennisoni (Camp, 1942) (Upper Cretaceous: Maastrichtian), and the taxonomic status of P. tuckeri (Camp, 1942). Journal of Vertebrate Paleontology 28(4):1043-1054. Lingham-Soliar, T. 1992. A new mode of locomotion in mosasaurs: Subaqueous flying in Plioplatecarpus marshii. Journal of Vertebrate Paleontology 12(4): 405-421. Lingham-Soliar, T. 1994. The mosasaur "Angolasaurus" bocagei (Reptilia: Mosasauridae) from the Turonian of Angola re-interpreted as the earliest member of the genus Platecarpus, Paläontologische Zeitschrift 68(1/2): 267-282. Lingham-Soliar, T. 1998. A new mosasaur Pluridens walkeri from the Upper Cretaceous Maastrichtian of the Lullemmeden Basin, southwest Niger, Journal of Vertebrate Paleontology, 18(4): 709-717. Lingham-Soliar, T. 1999a. A functional analysis of the skull of Goronyosaurus nigeriensis (Squamata: Mosasauridae) and its bearing on the predatory behavior and evolution of this enigmatic taxon. Neues Jahrbuch fuer Geologie und Palaeontologie Abhandlungen (Stuttgart). 213(3): 355-374. Lingham-Soliar, T. 1999b. What happened 65 million years ago: The study of giant marine reptiles throws new light on the last major mass extinction. Science Spectra 17: 20-29. Lingham-Soliar, T. 2002. First occurrence of premaxillary caniniform teeth in the Varanoidea: Presence in the extinct mosasaur Goronyosaurus (Squamata: Mosasauridae) and its functional and paleoecological considerations. Lethaia, 35:187-190. Marsh, O. C. 1880. New characters of mosasauroid reptiles. American Journal of Science, Series 3, 19: 83-87. Martin, J. E. 2007. A new species of the durophagous mosasaur, Globidens (Squamata: Mosasauridae) from the Late Cretaceous Pierre Shale Group of central South Dakota, USA. Pages 167-176 in Martin, J. E. and Parris D. C. (eds. ), The Geology and Paleontology of the Late Cretaceous Marine Deposits of the Dakotas. Geological Society of America, Special Paper 427. Martin, J. E. and P. R. Bjork. 1987. Gastric residues associated with a mosasaur from the late Cretaceous (Campanian) Pierre Shale in South Dakota. Dakoterra 3: 68-72. Martin, J. E. and J. E. Fox. 2004. Molluscs in the stomach contents of Globidens, a shell crushing mosasaur, from the Late Cretaceous Pierre Shale, Big Bend area of the Missouri River, central South Dakota. Geological Society of America, 2004 Rocky Mountain and Cordilleran Regions Joint Meeting, Abstracts with Programs, 36(4): 80. Martin, L. D. and J. D. Stewart. 1977. The oldest (Turonian) mosasaurs from Kansas. Journal of Paleontology 51(5): 973-975. Massare, J. A. 1987. Tooth morphology and prey preference of Mesozoic marine reptiles. Journal of Vertebrate Paleontology 7(2): 121-137. Massare, J. A. 1988. Swimming capabilities of Mesozoic marine reptiles: Implications for method of predation. Paleobiology 14(2): 187-205. Motani, R. 2010. Warm-blooded sea dragons? Science (Perspectives) 328:1361-1362. Nicholls, E. L. and S. J. Godfrey. 1994. Subaqueous flight in mosasaurs - A discussion. Journal of Vertebrate Paleontology 14(3): 450-452. Nicholls, E. L., and D. Meckert. 2002. Marine reptiles from the Nanaimo Group (Upper Cretaceous) of Vancouver Island. Canadian Journal of Earth Science 39(11): 1591-1603. Novas, F. E., M. Fernández, Z. B. Gasparini, J. M. Lirio, H. J. Nuñez and P. Puerta. 2002. Lakumasaurus antarcticus, n. gen. et sp., a new mosasaur (Reptilia, Squamata) from the Upper Cretaceous of Antarctica. Ameghiniana 39(2): 245-249. Páramo-Fonseca, M. E. 2000. Yaguarasaurus columbianus (Reptilia, Mosasauridae), a primitive mosasaur from the Turonian (Upper Cretaceous) of Columbia. Historical Biology 14: 121-131. Polcyn, M. J. and G. L. Bell, Jr. 2005. A new mosasauroid, Russellosaurus coheni nov. gen. et. sp., from the early Middle Turonian of Texas. Netherlands Journal of Geosciences / Geologie en Mijnbouw 84(3), p. 321-333. Polcyn, M.J. and Everhart, M.J. 2008. Description and phylogenetic analysis of a new species of Selmasaurus (Mosasauridae: Plioplatecarpinae) from the Niobrara Chalk of western Kansas. Proceedings of the Second Mosasaur Meeting, Fort Hays Studies Special Issue 3, Fort Hays State University, Hays, Kansas pp. 13-28. Polcyn, M. J., E. Tchernov and L. L. Jacobs. 1999. The Cretaceous biogeography of the eastern Mediterranean with a description of a new basal mosasauroid from Ein Yabrud, Israel. Proceedings 2nd Gondwanan Dinosaur Symposium. 15: 259-290. Polcyn, M. J., E. Tchernov and L. L. Jacobs. 2003. Haasiasaurus gen. nov., a new generic name for the basal mosasauroid Haasia Polcyn et al., 1999. Journal of Vertebrate Paleontology 23(2): 476. Rothschild, B. M., and L. D. Martin. 1993. Paleopathology: Disease in the Fossil Record. Boca Raton, Florida: CRC Press, 386 pp. Russell, D. A. 1967. Systematics and morphology of American mosasaurs. Peabody Museum of Natural History, Yale University Bulletin 23, 241 pp. Sakurai, K., T. Chitoku, and N. Shibuya. 1999. A new species of Mosasaurus (Reptilia, Mosasauridae) from Hobetsu, Hokkaido, Japan. The Bulletin of the Hobetsu Museum 15: 53-66. Schulp, A.S, J. W. M. Jagt, and F. Fronken. 2004. New material of the mosasaur Carinodens belgicus from the Upper Cretaceous of the Netherlands. Journal of Vertebrate Paleontology 24(3): 744-747. Sheldon, M. A. 1990. Immature mosasaurs from the Niobrara: a sampling problem? Journal of Vertebrate Paleontology Abstract 10(Supplement to 3): 42A. Snow, F. H. 1878. On the dermal covering of a mosasauroid reptile. Kansas Academy of Science, Transactions 6: 54-58, Figs. 1-2. Sternberg, C. H. 1922. Explorations of the Permian of Texas and the chalk of Kansas, 1918. Kansas Academy of Science, Transactions 30(1): 119-120. Suzuki, S. 1985a. Upper Cretaceous mosasaur remains from southern part of central Hokkaido, Japan; A preliminary report. Bulletin of the Hobetsu Museum 2: 31-42, 4 pl. Suzuki, S. 1985b. A new species of Mosasaurus (Reptilia; Squamata) from the Upper Cretaceous Hakobuchi Group in central Hokkaido, Japan. In Goto, et al. (Eds. ), Evolution and Adaptation of Marine Vertebrates, pp. 45-66. Association for Geological Collaboration in Japan, Monograph 30. Williston, S. W. 1891. Kansas mosasaurs. Science. 18(463): 345. Williston, S. W. 1898. Mosasaurs. The University Geological Survey of Kansas, Part V, 4: 81-347, pls. 10-72. Wright, K. R. and S. W. Shannon. 1988. Selmasaurus russelli, A new plioplatecarpine mosasaur (Squamata, Mosasauridae) from Alabama. Journal of Vertebrate Paleontology 8(1): 102-107.